On March 23rd, 2015, while flying home from our annual vacation, others on the plane were reading, playing video games, and napping. I, on the other hand, was having fun seeing if I could create an online hangman game for the new "Sports, Games, and Fun" section on the site. By the time we landed in Minneapolis I had the basic game working, but it took several more days of "work" to include all of the features I wanted to add to it. But I must confess. The additional time needed to complete the game was also partly due to constantly getting caught up in playing my own hangman game. I had forgotten how much fun we used to have playing the game as kids! Of course, back then all we had to work with was paper and pencil. Over 750 built-in words for 1 or 2 player games. Game keeps a running score of the number of wins out of the number of tries. 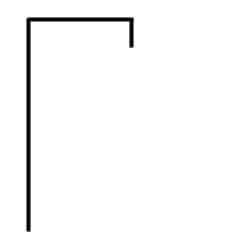 You can enter your own list of hangman words. This means parents can enter vocabulary words so their kids can have fun while learning their spelling words. The 2 player game includes an option that allows each player to enter and hide one word at a time for the other to guess. In this case, half the fun is seeing what funny words or short phrases you can come up with for each other. Push button keypad to also accommodate touch-enabled devices. An entered word can contain multiple words (Ohio, New York, United States of America, etc). 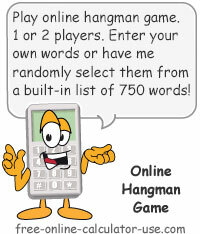 Play hangman online, 1 or 2 player. Use your own words or words randomly selected from a built-in list. Enter your own list of words (separated by commas or line returns, but not both). Let the game choose the words from its built-in list of over 750 words. Or, if playing a 2 player game, you and your opponent can take turns entering and hiding a word (or short phrase) for the other. Select the number of players for the game. The game always defaults to 1 player after each game reset. For a 2 player game, the orange arrow will indicate whose turn it is to start guessing the hidden word. Once you generate the blank lines using the visible word method button, start tapping/clicking the keypad letter buttons to enter your guesses. If a chosen letter is found in the word, the letter's button will be disabled (turned grey) and the letter will be displayed in the blank(s) it occupies in the word. If a chosen letter is not found, the hangman will be added to and the letter's button will be disabled. If you find all of a word's letters before the hangman is completed (head, body, arm 1, arm 2, leg 1, and leg 2), your number of wins will be incremented. If the hangman is completed (hung) before you find all letters in the word, only the number of tries will be incremented (#wins of #tries). In either case, win or lose, the "Reset for Next Word" button will be enabled. After clicking the "Reset for Next Word" button, the visible word method button will once again be enabled. Tapping or clicking the button will generate and hide the new word. In the case of randomly generated or single entered words, you can continue to play the game indefinitely. On the other hand, if you have entered your own list of words, each word will be removed from the list as it is used. Once all words have been used you will be prompted to reset the game. Important: Entered words must be letters only (no punctuation marks or symbols). This button will appear if you choose to enter your own list of words. Once you finish entering or pasting in your list of hangman words, clicking this button will save the words internally and hide the list. This button will appear if you choose to have the game randomly choose words from its built-in list. Clicking the button will select a random category, and then a random word within that category. This button, along with a text field, will appear if you are playing a 2 player game and have chosen to take turns entering a word for each other. The placeholder text in the field will indicate whose turn it is to enter a word. Once the word has been entered, clicking the button will hide the word and display the blank lines for the opponent to try to guess. This button will appear if you have chosen to enter your own list of words. Clicking the button will randomly select a word from your internally stored list, and then removes it from the list. When directed to do so, the online hangman game randomly selects from an internal list of 750 words covering the following word categories.